This decoupage tray is a super gift which kids can make for Mother's Day, Father's Day, Grandparent's Day or any other special occasion! And how about serving a surprise breakfast in bed on it! An old or inexpensive tray, the plainer the better, or a craft "blank"
If necessary, give the tray a coat or two of emulsion paint. Our tray had just a small border design, so we didn't need to do this - we just stuck the photos over the design to cover it. 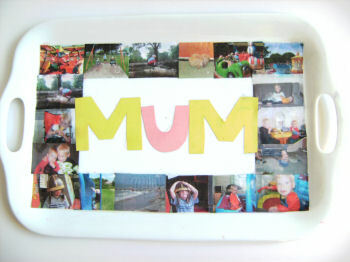 Arrange your photos until you are happy with the look of the tray, then carefully glue them down. Cut out letters from coloured paper to spell out the name of the recipient, and glue these to the tray. Paint over the top with a layer of glue to seal any loose edges and then leave the tray to dry. Paint on a layer of acrylic varnish to protect the tray. If you are making the tray for Mother's Day, you could make our Mothers day egg cup and egg warmer to lay on the tray and our I love my Mum flower and vase to decorate it - for a Mothers day breakfast Mum will always remember!